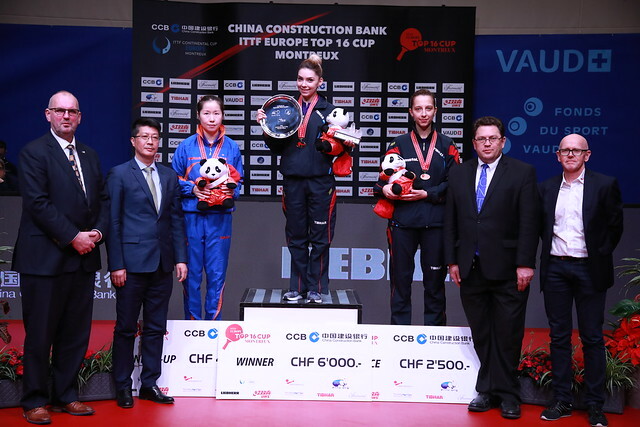 The quest to defend the titles won one year ago in Antibes, both Germany’s Dimitrij Ovtcharov and Li Jie of the Netherland fell one step short on Sunday 4th February at the China Construction Bank 2018 ITTF-Europe Top 16 Cup. Second place, the runners up spot was their lot. Dimitrij Ovtcharov, the top seed, in the Men’s Singles event was beaten in the title deciding contest by colleague, Timo Boll, the no.2 seed (13-11, 11-6, 11-3, 11-6); Li Jie, likewise the no.1 seed, experienced defeat at the hands of Romania’s Bernadette Scozs, the no.8 seed (12-10, 11-8, 11-6, 11-5, 11-7). Success for Timo Boll means that he has now claimed the title six times; in 2002 and 2003 he won in Rotterdam, in 2006 in Copenhagen before being crowned champion in 2009 and 2010 on Düsseldorf. He is now just win away from matching the all-time great; starting in 1984 in Bratislava and concluding in 1996 in Charleroi, Sweden’s Jan-Ove Waldner won seven times. A sixth for Timo Boll, a first for Bernadette Szocs, the win was somewhat of a surprise and underlines recent progress; her previous best in the tournament was sixth place last year in Antibes. Timo Boll and Dimitrij Ovtcharov now qualify for the Liebherr 2018 Men’s Cup where they will be joined by Denmark’s Jonathan Groth; the no.8 seed, he overcame Vladimir Samsonov of Belarus, the no.9 seed (7-11, 11-9, 11-9, 12-10, 4-11, 11-9, 11-6). Meanwhile, the one remaining place for an invite to the Women’s World Cup was secured by Elizabeth Samara, like Bernadette Szocs from Romania; in the play-off match she beat Sweden’s Matilda Ekholm (11-4, 8-11, 11-6, 11-9, 4-11, 11-8).